day 657: it's all about the shoes. there was a day, not so long ago, when getting shoes on odin was - at least according to him - a traumatic and tortuous event. but now it's all about the shoes. and when he's not greeting us in the morning at his bedroom door with his shoes in hand ( after he wakes up and grabs his shoes, he stands at his door, knocking, while saying "knock. 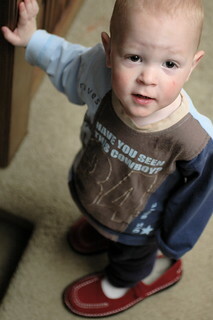 knock" ), he's spending great amounts of time and energy trying to put on our shoes and run around the house. someday he might be needlessly embarrassed to know he enjoyed wearing his mother's shoes, but for now he's just pleased as punch to show me just how quickly he can get up and down the stairs (!) with them on.